It's been awhile since I've used my crockpot and today I dusted it off to put it to good use. 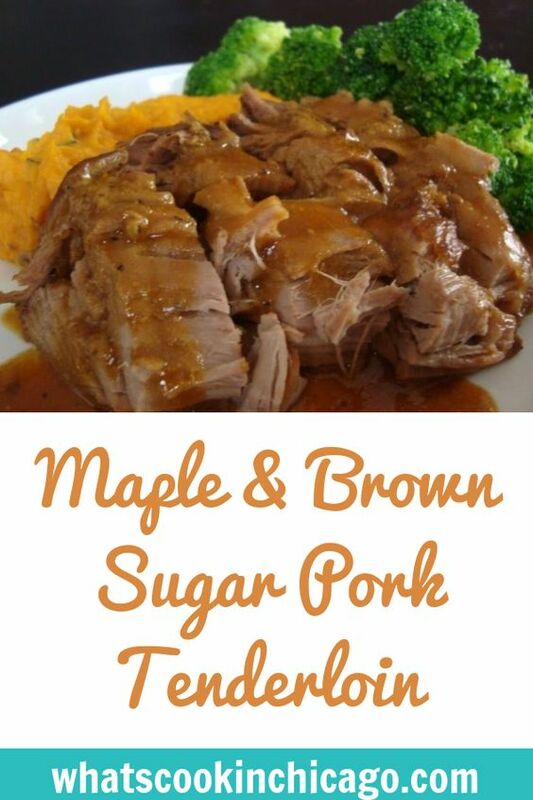 Today's crockpot contents is Maple & Brown Sugar Pork Tenderloin. This was extremely easy to prepare and the best part is that crockpot cooking allows me to focus on other things rather than being in the kitchen the whole time. Wash and trim the pork and pat dry; sprinkle lightly with salt and pepper. Place pork in the slow cooker. Combine garlic, mustard, honey, brown sugar, vinegar, thyme and maple syrup; pour over the pork. Turn pork to coat thoroughly. Cover and cook on LOW for 7 to 9 hours, or on HIGH for 3 1/2 to 4 1/2 hours. Remove pork to a plate, cover with foil, and keep warm. Pour the juices into a saucepan and bring to a boil over medium heat. Simmer for 8 to 10 minutes, or until reduced by about one-third. Combine the cornstarch and cold water; whisk into the reduced juices and cook for 1 minute longer. Serve pork sliced with the thickened juices. I paired this pork tenderloin with mashed sage sweet potatoes and steamed broccoli. Oh MY!! Joelen, this looks fantastic! I actually have two pork tenderloins in my fridge right now - I'm going to have to try this!! Mmmm... this sounds really good! I have 2 pork tenderloins in my freezer now, so I'll definitely be trying this on one of them. Looks so divine! My husband has been asking for some crockpot meals and this will be perfect! Thanks for posting! With all these busy days and nights, it might be time for us to break out the crockpot. Looks delish! Holy crap that looks amazing. that is one tender looking tenderloin! That looks all kind of tasty! What a great dinner idea. I never knew what to do with pork tenderloin. This looks delicious. This sounds so good! I am always looking for new ways to use my crockpot since I only have like 3 dishes, lol. I'll give this one a try for sure. It helps that it's ingredients I always have around! Yum! I love nice fall apart pork and your sauce sounds delicious. wow, that looks mouth watering! Wow!! This pork looks gorgeous, so tasty! I'll try it!! It looks so tender, positively mouthwatering! I've been thinking of getting a crockpot for so long, and this recipe pushes me even closer to buying one finally. Looks great! We buy pork tenderloin in bulk so I am always looking for new ways to make it. This recipe is definitely a keeper! This sounds really good! I've actually never made pork tenderloin before but have been wanting to try it. I made it tonight in the oven and we (especially DH) really liked it. I think it would be even better in the crockpot..give a chance for those flavors to soak in more. Thanks for sharing! This looks great and I'm going to make it for dinner tonight. When do I add the maple syrup? When it's in the crock pot or when I'm reducing the sauce? Thanks! Anonymous, thanks for your question - you add the maple syrup with the rest of the ingredients into the crockpot. I've updated the recipe to reflect. I found this recipe on pinterest. Boy am I glad I did. I made it tonight for dinner and it is fabulous. Thank you so much for sharing. It is very rare that I can find something that everyone in my family will eat. Everyone including my child went back for seconds. This sounds delish. I wonder if I could add some thinly sliced onions to the crock pot with this? Maybe double the sauce? May have to give that a try. Simply amazing! We are actually eating on hoagies. I had to sample before family got home the wonderful smell filling the house was killing me! It almost has a Chinese sweet Sour taste to it which I love! It's not spicy very hard to explain. I used honey from a local honey farmer so I could distinctly taste it and the maple syrup. We will add this to our recipe rotation! Great job! I don't see how many this serves. Any idea? How long do you think for a 5lb pork roast? I love my slow cooker it is a great way to prepare a meal in the morning and be ready to eat in the evening. I have been eating some pretty healthy recipes since I gained some much weight, but the slow cooker helps me with my diet. AOL? I need an expert in this area to solve my problem. Just ran across this on Pinterest, while looking for a pork tenderloin recipe. Looks like a great recipe, I just tweaked it and can't wait to see how it turns out. Thanks for the inspiration!